The National Homebrew Competition (NHC) is the “world’s largest international beer competition recognizing the most outstanding homebrewed beer, mead, and cider produced by amateur(s)”. The NHC has been conducted by the American Homebrewers Association every year since 1979, when 34 entries competed in the inaugural event in Boulder, Colorado. Last year, 5,166 beers were entered by 1,310 homebrewers competing for 84 medals and other prizes. Given the size of the event, it is divided into two rounds. The first round is conducted on a regional basis, with homebrewers sending entries to 10 regional contests, which includes Canada. The figure below shows the layout of the regions and where the actual competitions were held. The top three entries in each of the 28 Beer Judge Certification Program (BJCP) style categories advance onto the second and final round. The finals are held in conjunction with the National Homebrewers Conference, which for this year, is being held in Minneapolis from June 17-19. The second round judging is typically performed by some of the best beer judges in the world who evaluate the top ~30 beers in each category and award the respective winners. In addition to style awards, the one homebrewer who wins the most medals in the NHC is presented with the coveted Ninkasi Award, which includes a number of prizes and fabulous bragging rights. The 2009 Ninkasi winner was Gordon Strong, who also happens to be the current president of the BJCP board. Gordon is a repeat winner, who had 16 entries go onto the 2009 second round resulting in seven medals. With the 2010 first round already completed, Gordon again has 16 entries passing on to this year’s finals. Will anyone be able to unseat him? 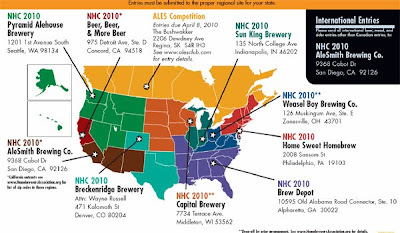 Here at Lug Wrench Brewing, we submitted two entries to the NHC. Tom sent in a black raspberry and blueberry standard melomel (fruit mead) that scored a 35 out of 50 points, but the judges thought it a bit too acidic and alcoholic. He also sent in a dry English cider that scored 32 out of 50 points, with the general feedback that it had too much “farmhouse” character and not enough apple essence. Let us know how you did? For complete information on the 2010 NHC, see the official rules and regulations.